Melt margarine in large saucepan over medium heat. Add onion; cook and stir 3 minutes. Add squash and 1 can broth; bring to a boil over high heat. Reduce heat to low; cover and simmer 20 minutes or until squash is very tender. Purée soup in batches in blender, returning blended soup to saucepan after each batch. * (Or use hand-held immersion blender.) Add remaining can of broth, nutmeg and pepper. Simmer, uncovered, 5 minutes, stirring occasionally. Ladle soup into 6 serving bowls; serve with yogurt and chives, if desired. 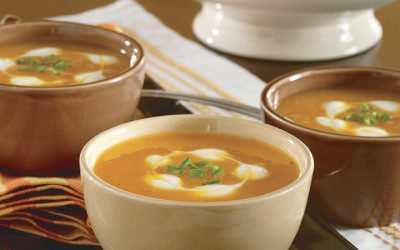 *Variation: Add 1/2 cup whipping cream or half-and-half with the second can of broth. **Gluten Free: To make this dish gluten free, be sure to read ingredient labels carefully and purchase gluten-free chicken broth.